After many months residing in Beijing to receive cancer treatments, retired King Norodom Sihanouk will return to Cambodia next month. 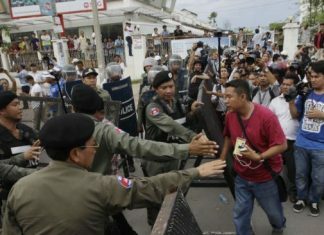 The retired King announced his intention to return to Cambodia in a June 27 message sent to the media on Sunday. “Between July 9 and Sept 2009, I shall have the honor and the joy to live in Cambodia among my beloved relatives,” the retired King wrote. According to Prince Sisowath Chakrey Noupol, a Royal Palace aide, Norodom Sihanouk and his wife Queen Monineath will fly into Siem Reap and stay at the royal residence there during their time in Cambodia. He added that the retired King was timing his arrival to coincide with a Buddhist holy day. However, the King Father said he must return to China after an approximately two-month stay here in order to receive several more months of medical treatment. “In September-October-Novem­ber-December 2009, my most eminent PRC doctors are asking to be consent to an anti-Cancer Treat­ment in Beijing. The aim of this Treatment is to prevent a possible return of my cancer, which has just completely disappeared,” the retired King wrote in his message. The King Father announced earlier this month that his third bout with B-cell lymphoma was over and the cancer was in complete remission. The 86-year-old monarch was first diagnosed with the disease, which affects blood cells crucial to the body’s immune system, in 1993. It flared up again in 2005 as gastric lymphoma. Upon announcing his third bout with the disease back in Dec­ember, the King Father noted that his Beijing doctors had told him that the cancer had not spread through his body and was in an area that allowed for relatively easy treatment.